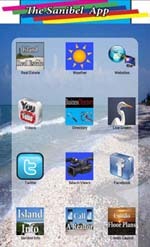 Sanibel Island Real Estate, Captiva Island Real Estate - Great Sanibel Island Home for sale! 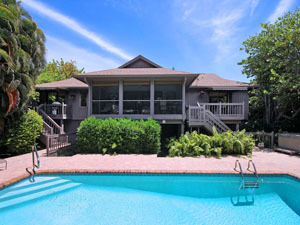 Great Sanibel Island Home for sale! 1041 Blue Heron Drive - Just Steps to the Beach! This beautuful home is an extremely private near-beach home located in the Gulf Shore subdivision. Located only a few steps away from your deeded beach access, this meticulously maintained house has 3 bedrooms and 2.5 bathrooms with a large, private pool. You are near everything we appreciate about our islands! Besides miles and miles of our beach, you are just a short bike ride from the Ding Darling Wildlife Refuge. This stunning home should be yours! The vaulted, open living area leads to a screened lanai that overlooks the pool and the beautiful landscaping. This is truly a welcoming home for family and friends! The kitchen is good-sized with an eating area and a laundry room with pantry. Along with the private pool, there is a hot tub for your enjoyment! The main bedroom suite has a large bathroom and attached sitting area. 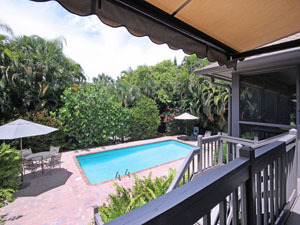 The lush, tropical landscape provides a private and enchanting environment. This large home has a living square footage (according to Lee County) of 1869 feet. This is one of those homes that has just about everything and is very inviting and comfortable. There is LOTS to like about this property! 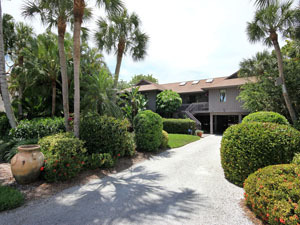 You will want to make 1041 Blue Heron your Sanibel Island address! This is a great time of year to be on the islands! The weather is fantastic and the crowds are starting to migrate north. I hope to see you soon and show you what our islands have to offer! Whether it's a condo, home or homesite - we have a great inventory of properties!